The local food advocacy group, Strolling of the Heifers has issued its fourth annual Locavore Index, which ranks the 50 states (and Washington, D.C.) “in terms of their commitment to healthy local food.” The current 2015 ranking has incorporated “newly available information” from the United States Department of Agriculture Statistic Service’s Census of Agriculture on direct-to-the-public sales by farmers by dollar volume (including at farmers market, community-supported agriculture operations (CSAs), farmstands and on-line sales). No surprise that the green state of Vermont again tops the list, as it has since the first Locavore Index was compiled in 2012. And this is not a consequence of Strolling of the Heifers (based in East Dummerston [Windham County, Vt] just north of Brattleboro) favoring its home state. In addition to the important variable of the dollar volume of direct-to-the-public sales by famers noted above, the Locavore Index also factors in the following variables in determining the rankings of states: total number of farmers markets and CSAs, Farm-to-School percent (percentage of school districts with Farm-to-School Programs), and Food Hubs. 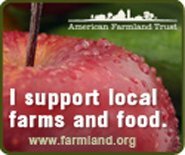 Scores are weighted: farmers markets per 100,000, 15%; CSAs per 100,000, 15%; Farm to School Percentage 15%; Food Hubs per 100,000, 5%; Direct sales per capita, 50%. The states of Hawaii and Rhode Island deserve special praise for their perfect scores of 100% for the percentage of school districts with Farm-to-School Programs. Delaware comes close with 95% of its school districts with Farm-to-School Programs. And kudos to Virginia which tops all the states with its 18 Food Hubs. Special mention and praise should be given to Massachusetts’ rise in the rankings from 28th in 2012 to fifth in the 2015 Locavore Index. Similarly, I was pleased to see my home state of New York rise from 42 in 2012 to its current overall ranking of 20 in the 2015 Locavore Index. CLICK HERE to see the results for your home state in the most recent rankings. The mission of Strolling of the Heifers is to support “the development of stronger local food systems and healthy, sharing, connected and resilient communities.” Inspired by the famous running of the bulls in Pamplona, Spain, the non-profit organization’s founder, Orly Munzing, “as a way of honoring and supporting local farmers” organized a slower and female version of the running of the bulls. In late spring, the group sponsors a local foods festival, which begins with farmers slowly parading their heifer calves up Brattleboro’s Main Street. After the parade at a “Slow Living Expo,” people can “meet the heifers up close and personal” on the Brattleboro Common and Brattleboro Retreat grounds. Local food producers, regional craftspeople, cheese producers, cooking demonstrations and shows by the New England Center for Circus Arts are featured at the Expo. This year’s Strolling of the Heifers Weekend will be held June 5, 6 and 7, 2015 with the parade on Saturday morning.